What’s It About? 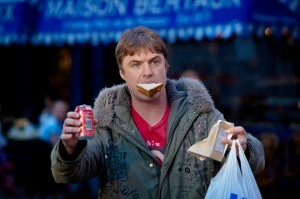 Welsh postman Dixie (Jonny Owen) is fanatical about music, and substitutes fresh country air for London smog after stumbling upon a band called The Prems on YouTube. Aspiring to become the next Brian Epstein (The Beatles) or Don Arden (Black Sabbath), Dixie hauls his lover Michelle (Vicky McClure) down south in an endeavour to sign the band for a major music label. Now Dixie mingles with the notoriously dithering A&Rs of the music industry, relying upon a happy-go-lucky Welsh charm to succeed in promoting his talented band. Yet it’s not all plain sailing, financial woes and a feisty rocker hinder Dixie in his bid to drag The Prems out of musical anonymity. Verdict? Svengali, directed by John Hardwick, attempts to woo audiences with its bright, perky message that one’s dream should be the focus of life’s pursuit. And for the most part, this element is rather inspiring – Dixie battles recurring adversities to achieve his goals, heeding his father’s stern advice to make his own mark in the world. Svengali boasts a cast laden with cameos, which include Martin Freeman, real life music tycoon Alan McGee, Libertines front man Carl Barat and pop star Katy Brand. The performances are solid, but letdown and limited by the primitive script. Vicky McClure of This Is England stands out in her role as Shell, Dixie’s puppy-eyed, relentlessly faithful girlfriend. Interestingly, Svengali casts Michael Socha (Tommy) as the guitar lead, also hailing from This Is England, who gives another decent performance. Svengali aims to standout as a joyful British music romp, but unfortunately, the simple screenplay and its thrills prove unnecessarily jarring. The experience is merely unsatisfying. Dixie appears to be on the cusp of greatness, The Prems – enigmatic, good looking and nonchalant – possess the character traits of Britain’s rock gods, but the flurried sequence of events always seems to leave an unavoidable, impotent outcome. The band is heralded in the music industry as the next British fancy – note that the audience never hear the music – yet there is a frustrating pathos to Dixie’s involvement with The Prems, resulting in a sour apple for the viewer. Each of Dixie’s hardships appear bewilderingly unfortunate, and his financial ruin would be quite solvable if there weren’t always a pathetic crisis to deal with. For all its faults, Svengali is somewhat enlightening in places, shining a torch on the flaky nature of the British music industry, and depicting the corporate agendas to exploit those with talent. A couple of scenes in particular garner poignancy, Dixie visiting his poorly father and another when the likeable Welshman fights with Michelle – both events providing a slight somberness to the film’s tongue-in-cheek script. The run of scenes, however, is predictable rather than entertaining, perhaps being Svengali’s greatest flaw of all. 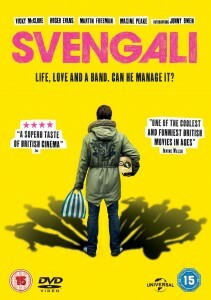 Svengali should have been a cheerful, British indie flick, but instead the script serves a dish of rotten ingredients. Final Words: Credit to Jonny Owen for writing, starring and producing – a jack of all trades – but, whilst providing a charismatic lead performance, Svengali will regrettably end up gathering dust. Svengali is available to own on DVD and Blu-ray on 7 April 2014.